Cryotherapy is a common procedure that uses extremely cold temperatures to destroy abnormal tissues or cancer cells. 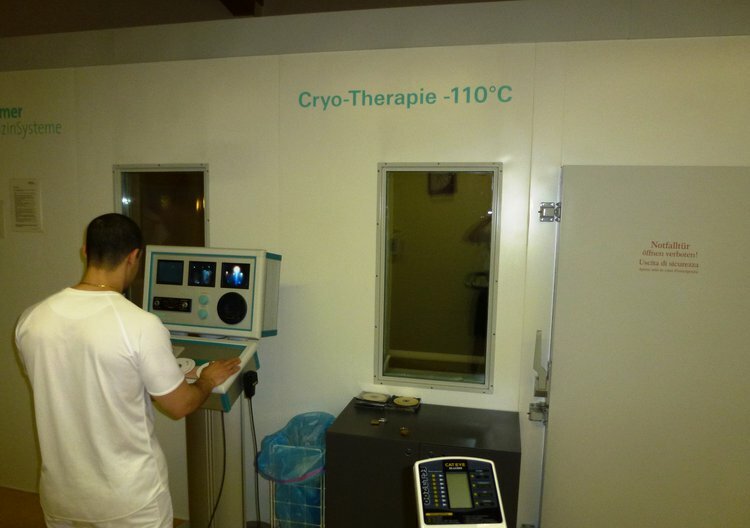 This image shows a Cryotherapy Chamber in Austria. Topical Cryotherapy is used typically in the case of skin and eye lesions. Why is the Cryotherapy radiology procedure Performed? There have been no recent advances to replace the Cryotherapy procedure. What is the Cost of Performing the Cryotherapy radiology procedure? The cost of the Cryotherapy procedure depends on a variety of factors, such as the type of your health insurance, annual deductibles, co-pay requirements, out-of-network and in-network of your healthcare providers and healthcare facilities. How does the Cryotherapy radiology Procedure work? How is the Cryotherapy radiology procedure Performed? Percutaneous skin treatments are outpatient procedures, while treating tumors or other ‘deep’ treatments, require a short hospital stay under supervision of a medical staff. A specially-trained interventional radiologist usually performs the Cryotherapy procedure. The Cryotherapy procedure takes about 1-3 hours. A physician will request your consent for a Cryotherapy procedure using an Informed Consent Form. During Cryotherapy for prostate cancer, nerve damage may lead to impotency; blocking of the urthera may occur due to dead tissues. What are the Limitations of the Cryotherapy radiology procedure? What is the Cryotherapy procedure? What is to be expected during the Cryotherapy radiology procedure? General anesthesia is administered during the Cryotherapy procedure. Crytherapy procedure does not involve the loss of blood. What are the possible Risks and Complications during the Cryotherapy radiology procedure? There is a slight chance of getting cancer due to excess radiation during X-ray. What Post-operative Care is needed at the Healthcare Facility after the Cryotherapy radiology procedure? The patient may be required to stay at the healthcare facility for overnight observation, after the Cryotherapy procedure. What is to be expected after the Cryotherapy radiology procedure? What Post-operative Care is needed at Home after the Cryotherapy radiology procedure? The patient should fully recover, a week after the Cryotherapy procedure. No tissue sample is taken during the Cryotherapy procedure. Who will you receive a Bill from after the Cryotherapy radiology procedure? The patient is advised to inquire and confirm the type of billing, before the Cryotherapy procedure is performed.